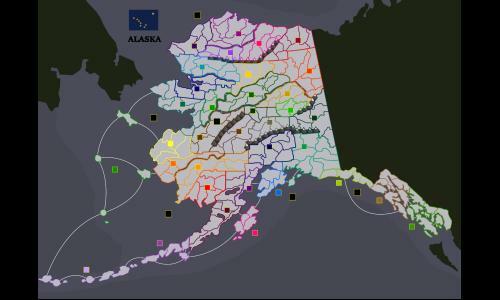 A detailed map of the great US state of Alaska, divided into census areas and boroughs, and further divided along somewhat arbitrary geographic lines. Territories are basins and arbitrary areas created from topography. Mountain ranges and major rivers are barriers. Review by Klewer on 10/28/2018. Review by END*-*FIRE on 11/4/2018. Review by warhawk on 11/4/2018.